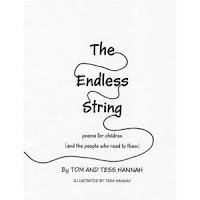 Back in April 2010, I had the pleasure of interviewing Tom and Tess Hannah, authors of The Endless String: Poems for Children and the People Who Read to Them . This was my first ever interview I conducted in my "Surprise Party" Series. I am still very appreciative that they agreed to the interview. It allowed me to experiment with a new idea and find a format that was going to work for my blog. Not only that, it also gave me the confidence as a blogger that I was searching for at the time. My children and I revisited The Endless String this week to celebrate Tom Hannah's birthday. In the book, there are over 60 poems and many are illustrated with simple black line art by his wife Tess Hannah. I read many of the poems to my daughter, age 5, and my son, age 3. Tom and Tess recommend their poems for children up to the age of twelve. There is a great variety of poems throughout the book, and you are sure to find one that will make you laugh! Thanks for the chance to share our book again. I am forwarding a poem that my wife wrote which I love. Someday if we do another book, I think this poem will be the title of the book. an ogre, huge and vicious. it sent my senses reeling. who 'round the placement raced. I hungered for much more. my plate crashed on the floor! which morsel should I eat? though my nerves were nearly numb. not even one small crumb. I barely could stay seated. from mixes of great writing. I thought I would repost the interview from April 28, 2010 to celebrate Tom Hannah's birthday. Don't forget to check out the lesson ideas provided by Happy Birthday Author at the end of the post!